To make today’s recipe for raw chocolate chip cookie dough, I went right to the source. The recipe I am about to share is based entirely on the original recipe for Toll House Chocolate Chip Cookies. 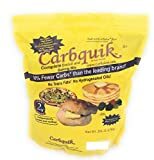 I just swapped out nearly all of the ingredients for low carb sugar free alternatives. So instead of regular and brown sugar, I used the regular and brown versions of Swerve Sweetener. And in place of white flour, I added the Carbquik Baking Mix. And for the final but ironic touch, I passed up the Toll House Chocolate Morsels and used Lilly’s Sugar Free Chocolate Chips. It seems a bit ungrateful, I know. But each cookie dough ball has less than 1g net carbs. So I don’t feel too bad about it. This recipe for Low Carb Toll House Chocolate Chip Cookie Dough is a low carb take on the original Toll House recipe. 1. Beat together sweeteners, vanilla and butter in a medium sized bowl with an electric mixer until light and fluffy. 2. Beat egg into the mixture. 3. Beat Carbquik into the mixture until dough forms. 5. Scoop out heaping tablespoon sized amounts of dough and roll into balls. 6. Chill in the refrigerator for 1 hour. 7. Keep stored in the refrigerator. This recipe is better raw than baked, but if you want to actually use the dough for cookies, then add 1/2 teaspoon baking soda to the dough and bake at 350 degrees F for 10-12 minutes. If you liked this cookie dough, then you might like my recipes for Caramels, Pecan Pie Bites or Lemon Lime Cheesecake Bites. So can I bake these or what? They taste good raw, but now I’m in the mood for a cookie.